After a fairly lengthy journey including a 3 hour transfer in Kuala Lumpa airport, I landed at Siem Reap at midday on Thursday 28th February as planned. The heat of 35 degrees felt sweltering after wintry London! I had a fun tuk-tuk ride to the hotel I was staying in, during which I saw all manner and numbers of people and objects being transported on motorbikes. For the evening I was spending in Siem Reap I had managed to arrange meeting up with a few other AfID volunteers for dinner. It was really good to meet them and to hear about their experiences of being accountant volunteers in Cambodia. 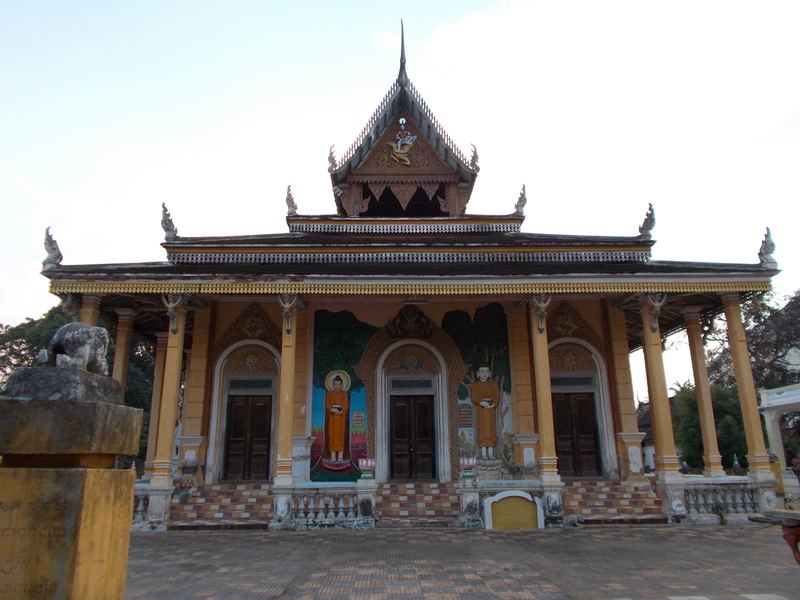 The next day (Friday) I got the bus to Battambang, the nearest town to KNGO. I was met from the bus by Kat who currently volunteers at KNGO and with whom I had Skyped a couple of times before I left the UK. It was great to see a familiar face amidst all the tuk-tuk drivers vying for my trade! We travelled the 5km to Bospo Village and KNGO (me by tuk-tuk with my luggage, Kat on her motorbike) where I was warmly welcomed by Saveth, KNGO director, and some of the teachers. I have been eating meals so far with Saveth and his family. Saveth’s wife Saari cooks delicious meals of rice with various dishes – beef with a type of asparagus, chicken with spring onions and lemongrass, fish stew with mint and pak choi…to name a few. I am certainly being very well looked after! As well as settling in to my room – this is in the large house of Saveth’s parents, just round the corner from KNGO – I spent the rest of the weekend exploring the city of Battambang along with Jimin, a Korean volunteer who was staying just a week to help with English teaching. We visited a couple of the Buddhist temples, in one of which we were very warmly greeted by the monks. It is usual here for young men to spend some months or years as a monk, before beginning work and/or getting married. We also had lunch on Sunday at a pizza house, of all places! Whilst I am greatly enjoying the wonderful cooking of Saari it was a treat to have something more familiar for a change. Today is Wednesday and I have now had three days of volunteering in the KNGO office. I’m getting a good idea of how things work and of where my help is most needed. I managed to introduce shortbread to the office yesterday (which miraculously survived the journey from the UK!) and it seemed to go down pretty well! So far, after nearly a week in Cambodia, I am mainly overwhelmed at the friendliness, welcoming nature and generosity of people here. They want to share with you whatever they have, even if it may not be very much.